My teenage son enjoys acting and is pretty darn good at it so when he got his first role in a real play in late 2009 with SKIT Theatre I volunteered to donate my graphic design skills to the production. He is now working on his fourth play for SKIT Theatre and so I just finished posters and t-shirts for this production as I have the others that he has participated in. It's been fun but also a challenge. 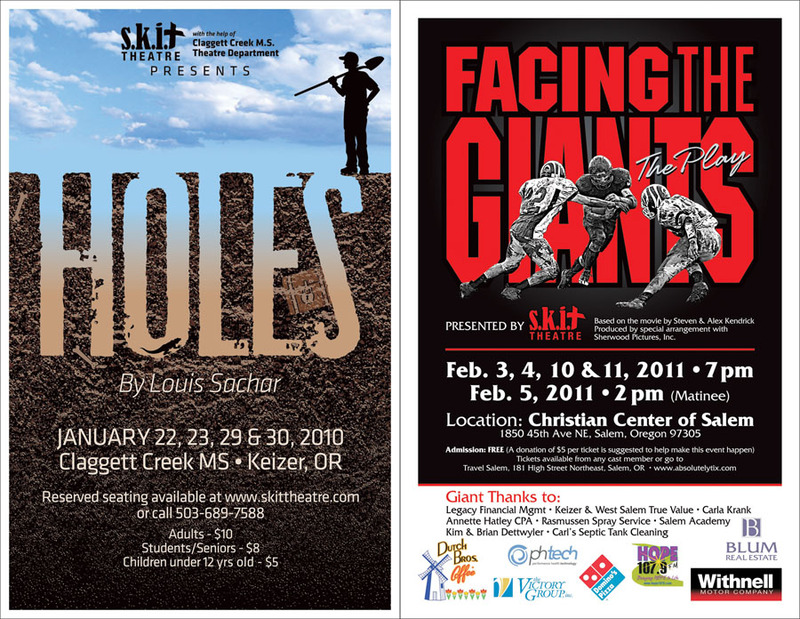 Each play is based on an already recognizable movie so creating my own unique graphic that still reminds the viewer of the story and takes advantage of the brand equity is tricky. Sometimes the limitations put on me have been hard to work with but I feel good about the end results. The newest one is A Christmas Story and this is a good example of the challenge I'm speaking of. Not only is this a period piece so I couldn't make the graphics look too modern but it also had to feel like a fun Christmas production. I wanted to break away from the use of the iconic leg lamp because it has been used so much by others who have created designs for this story. The problem was that if I told someone that the play was A Christmas Story most of them didn't know what I meant until I said, "you know the one with Ralphie, the Red Ryder BB Gun, and the leg lamp?". So I thought it needed to have one of those key elements and so I chose the leg lamp because I wasn't sure what Ralphie was going to look like and putting a gun of any kind on promotions for a kids event could be trouble. Below are the previous three posters I created. Thanks to my friend and awesome photographer, Mike Bartlett for the use of the football photo I used in the Facing The Giants graphics. And here are two of the t-shirt designs I designed to go with the posters. If you would like to use any of these graphics for your own production use the contact form on my About page to ask me about it. For a small fee I would be willing to send you the artwork in whatever format you need.